The lots at the corner of Northlawn Street and Santa Maria Avenue in Bagley was a dumping ground full of trash. To make matters worse, the street had poor drainage because of a buildup of dirt and grass, which made it a challenge just to cross the street. “This is ridiculous,” Joe Marra, who’d drive past the lots every day for a better part of a year, recalls thinking. In the spring of 2016, Marra started picking up garbage, clearing the drain, and chipping up fallen trees; he once had a tree-trimming business in northern New Jersey, where he’s from. Marra came to Detroit for the first time in 2011 and went back and forth until nearly three years ago, when he “took the plunge” and permanently moved here. He was used to having lots of open space, and says one of the biggest shocks of moving to Detroit was the lack of it. So he started pushing for a pocket park. Marra brought his idea to a Bagley Community Council meeting, where fellow resident Samoy Smith listened with great interest to Marra’s vision of turning the blighted piece of land into green space. The two connected, and along with another partner, Vicky Sahami, went on to found Creating Space Detroit, a 501(c)3 nonprofit. They bought the lots from the Land Bank for about $200. Their goal is to raise $8,440 through a crowdfunding campaign to secure permits to begin building the park. The lots are cleaned up now but the park is essentially two picnic tables under a mulberry tree. By spring, they hope to get started on the process of installing playground equipment, bench seating, solar lighting, a pavilion or gazebo, and a Little Free Library. Creating Space Detroit has also applied for a $6,500 grant through Detroit Future City to pay for landscaping. According to the project’s crowdfunding page on ioby, with only 6.7 acres per 1,000 residents, Detroit falls well below the National Recreation and Park Association’s recommendation of 10 acres of park space per 1,000 residents. 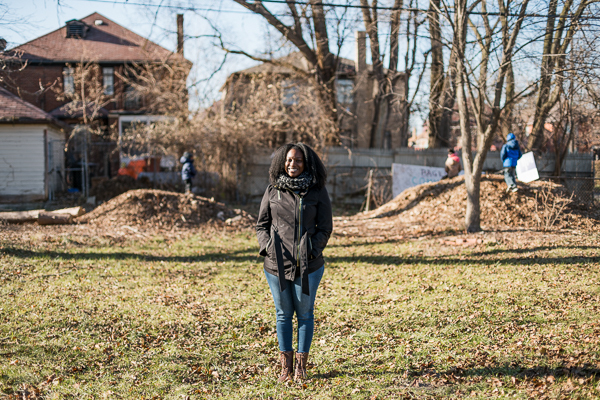 The Detroiters behind Creating Space Detroit have a vision for building a pocket park the community will enjoy, but that’s not all. There are also plans to clean up and connect all the alleys them to create a bike path throughout the neighborhood. They also have an eye on purchasing and rehabbing the vacant house next to the lot to provide educational programs there. This initiative is of special importance to Smith, who went to school for elementary education and homeschools her three young children. “We would do a literacy program for early childhood; I feel that’s really important and something I can offer,” says Smith, who also teaches at a homeschool cooperative in the city. The house would also be used as a community gathering space. The house would be a “nice little hub to have everything in the same spot,” she adds. The organization has reached out to the owner of the house to purchase it, but hasn’t had luck so far. The motivation and driving force behind the vision for their neighborhood is to bring people—their neighbors—together. The idea of a pocket park in a neighborhood with little park space was initially met with some skepticism. But for Marra, the key is building trust and going from there. One day, his neighbor took notice of Marra cutting the lawn and came up to him and said she was sending her husband over with the big riding mower. “They’ve been cutting it now since the summer—it’s fantastic,” Marra says. At Creating Space Detroit’s launch event in late October, Smith recalls seeing a few kids playing football on the sidewalk, removed from the action. At first, they they were apprehensive and didn’t want to talk, so Smith gave them bags of chips and Capri Suns and invited them to play. Pretty soon they were all playing football in the open space.